Best of Houzz 2019, 2017, 2016, 2015, 2014, 2013 and 2012! Olga Adler's award-winning interior design studio creates spaces that are instant conversation starters – aspirational and unique, luxurious and comfortable. We manage all aspects of design and project management from floor plans to finishing touches. We were just featured on the cover of "Boca Life" and our work is also published in "Home and Garden" and "Gold Coast" magazines. Our designers have the aesthetic, practical and technical expertise to plan, schedule, execute and manage your interior project from start to finish, as well as knowledge about products, materials and finishes. We always combine architecture with design style that will enhance our clients life style and well being. Designing a personal residence or a corporate office is a collaborative effort. Our solid reputation will prove with results in a space that is beautiful, authentic and distinctive. TURBO BEDS specializes in luxury furniture for kids, bringing you the best children’s racing car beds and quality bedroom sets. Our car bed for boys come with flashing headlights, custom stickers all available in multiple awesome colors. Our pink girl car bed is just as fun. Check out all our themed-furniture styles today, from pirate beds to princess beds and of course, our luxury car beds. We are a licensed Interior Designers, Architects, Landscape Designers and Special Events Designers with several offices- NYC metro area, Miami Beach and Europe. Kenneth Davis Lux International provides all aspects of Architecture, Interior Design, Restoration, Landscaping and Special Event Services. Kenneth Davis Lux International is owned and operated by Kenneth J.P. Wilkinson III, CID and Davis F. Tamburin, RA, AIA. KD LUX encompasses the best of both worlds. As licensed Architects and Interior Designers with our design team, we provide our clients a united vision in both our residential and commercial projects. We provide Luxury, Comfort and Style that intrigues a client! Our rooms and a constant discovery for our clients. Through our eyes, your home or business will be the best it can be. With several offices- NYC metro area, Miami Beach and Europe, we are able to cater to any of our clients needs. Please note our newest address; 828 3rd Street, Suite 314, Miami Beach, Florida 33139. TODAY'S INTERIOR DESIGN WITH YOU IN MIND. Chambray Avenue is a licensed interior design firm specializing in timeless design. With our personalized service, we create inspired, one-of-a-kind designs that reflect the essence and lifestyle of our clients. At Chambray Avenue every client and every project is important to us. Ft. Lauderdale designer Carlos T. Adharsingh is known for his creativity in combining textures, colors, and styles. He places equal emphasis on defining the function of the space, as well as creativity, for the best design solution. In his 17 year history, he is proud to have worked through-out Southern Florida, the U.S. and internationally. From penthouse to townhouse, Carlos always earns his clients' trust, satisfaction and repeat business. Carlos Adharsingh’s academic training is diverse. Beyond studying Interior Design, he draws inspiration from his knowledge of Architecture, Fine Art, and Technical Drafting. Although the education he received at Miami's International Fine Arts College was of tremendous merit, the real education came after graduation. Working in the industry with some of South Florida top designers, Carlos worked towards earning his Florida Interior Design License, and establishing his own Interior Design Firm "Chambray Avenue". SOJO Design is an award winning, full service, Interior Design firm founded in 2001 by Swedish-native, Sofia Joelsson. 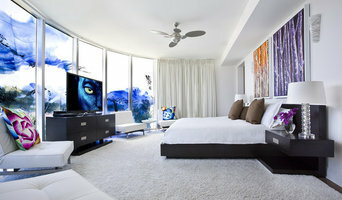 Headquartered on historic Ocean Drive in Miami Beach with a satellite office in the iconic Chrysler building in New York City, the firm specializes in luxury residential homes and private jets as well as providing consultation for hotel, office, and condominium buildings nationally and internationally. Since its inception, SOJO has created unique spaces for over 500 projects representing more than one billion dollars of real estate. SOJO has cultivated a superb working relationship with some of the industry’s most talented builders and professionals, the firm is able to handle the most complex of design challenges. Spanning across conceptual vision complete interior designs, space planning and furniture & accessories selection, SOJO is there from conception to completion. We partner with you to make your dreams a reality, always focusing on the personalized details that make your space one-of-a-kind. The goal, ultimately, is to create bespoke designs for people who truly value lifestyle. What We do: Art Line Furniture is the premier in interior design and custom furniture. We start with an in-depth consultation with each client to understand there demands. Next we design and hand pick the finest materials imported from around the world to match each clients style. From the blue prints down to installation, we keep the customer involved in every step. Why Choose Us After twenty three years in business Art Line Furniture has acquired the experience and success to say we are the best in the industry. Our customer satisfaction rating is proof that we put the client first. We never take shortcuts when it comes to our craft, that's why Art Line is the right fit for you! Interior Design, Kitchen Design , Bath Design Interior Remodeling, Interior Decoration, Project Management ,Condo Decoration for second homes , Luxury Sales, Home Staging to Sell. With over 15 years of industry experience in the South Florida market with residential and commercial clients, All Things Taj, LLC provides their clients with a modern aesthetic refined with art, culture and sophisticated details that truly tells our clients story. This is our methodology of making your space so much more than a pretty place, it transforms into an experience with fulfillment and purpose. Bonefide Design was founded to establish a genuine work environment amidst a tough to navigate Miami market. I create environmentally conscious and sustainable artwork using mainly recycled materials. I also happen to have quite a nack for designing interior spaces and love the personal collaborative aspect of working with someone on their home. I wanted to embrace great work, great design and most importantly a renewed faith in the process; so lets talk. bo·na fide(bō′nə fīd′, fī′dē, bŏn′ə)adj. 1. Made or carried out in good faith; sincere: a bona fide offer. 2. Authentic; genuine: a bona fide Rembrandt. See Synonyms at authentic. [Latin bonā fidē : bonā, feminine ablative of bonus, good + fidē, ablative of fidēs, faith.] I am a born and raised Londoner now living in the ever growing Miami metropolis. I am first and foremost an artist and creator. I live for aesthetics that know no boundaries and have subsequently spent the last four very rewarding years working in interior design, decorating and styling. I have always been drawn to materials and spaces that leave a lot to be desired and love nothing more than reinvigorating people’s perceptions of beauty. I have worked on projects of various sizes ranging from a bedroom remodel to an entire new home from the ground up. This has included drawing floor plans and working with Architects, project managing with Contractors, right through to that last throw pillow and accessory! I graduated from Middlesex University in London with a Bachelor of Applied Arts. Essentially a very hands on, versatile degree that allowed me four years to explore everything from fashion design, jewelry making, glass blowing, textiles and so much more. What is slightly more unique is that I chose to specialize in concrete. Whether it be due to my love of architecture instilled by my late Grandfather Dennis Page, or my attraction to materials people generally (at that time anyway) considered ugly...I was hooked from my first mold! This experience has allowed me to include my art work and pieces throughout clients homes and really add that unique touch to an interior space. Kendall Marcelle Design Assoc. Inc.
Kendall Marcelle Design Associates Inc. is a dynamic and ambitious interior design firm dedicated to the creation of innovative interiors that reflect the individuality of each client. We believe that quality design knows no boundaries. While one client may prefer a classic or traditional look, another may prefer a contemporary or eclectic look. With over 20 Years' experience, we have no limits on design motifs. Our work reflects integrity, thought and care while, at the same time, shows flexibility in design and the designer. Mimi Friend is a Residential Interior Designer based in South Florida. After receiving her MFA from NYSID, one of the top 5 interior design schools in the country, Mimi worked at Livingston Builders and Gramatan Corporation, gaining invaluable experience in the architectural and construction spheres of the design industry. Recognized for her elegant and eclectic style, Mimi specializes in curating unique and sophisticated interiors that balance warm textures and clean lines with punctuations of understated elegance. Her most recent projects include a Modern Scandinavian villa in Hollywood and a Contemporary residence in Boca Raton.